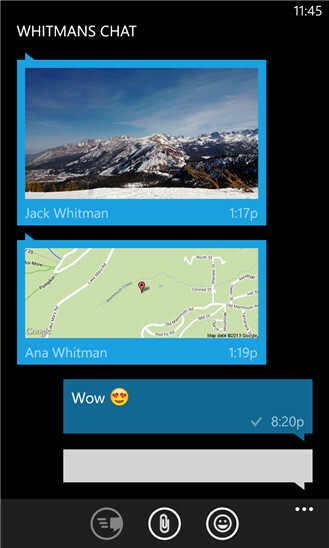 WhatsApp Messenger is a FREE messaging app available for Windows Phone and other smartphones. WhatsApp uses your phone's Internet connection (4G/3G/2G/EDGE or Wi-Fi, as available) to let you message and call friends and family. Switch from SMS to WhatsApp to send and receive messages, calls, photos, videos, documents, and Voice Messages. • FREE CALLS: Call your friends and family for free with WhatsApp Calling, even if they're in another country. * WhatsApp calls use your phone's Internet connection rather than your cellular plan's voice minutes. Available on Windows Phone 8+. (Note: Data charges may apply. Contact your provider for details. Also, you can't access 911 and other emergency service numbers through WhatsApp). • WHATSAPP WEB: You can also send and receive WhatsApp messages right from your computer's browser. 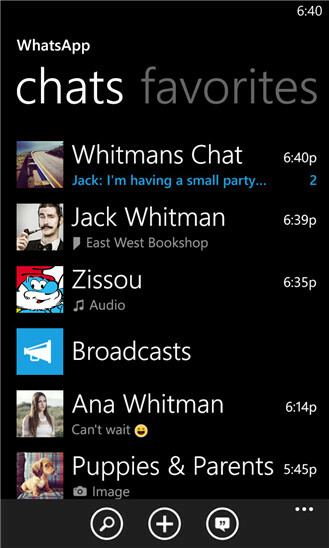 Available on Windows Phone 8+.